Thank you for your incredible work. Just right now in Friuli at a conference. I took the jump. Only for my main homeserver and I did make a snapshot before removing the repo lock. 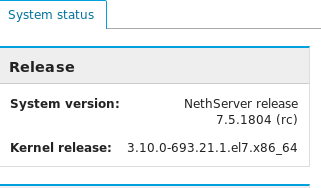 650packages updated and now running a new and shiny NS 7.5 RC! Because both options have been removed before final package release. The firewall should be able to do a good QoS without any special options. I removed the section from the manual. Plan your updates and have the commands ready in a text editor. When you log into the Cisco router, set an automatic restart for x number of minutes time (x being the number of minutes + an extra 2-3 spare minutes). Run the various commands to update the router config. 4a) If everything works, save the new configuration and either cancel the router restart or allow the router to restart. To keep things clear: scapegoat (my NethServer installation test) is a crappy Acer Veriton with AMD CPU that don’t seems to handle at best the reboot. I don’t remember the kernel version which started to do the trick (installation started with 7.3) but i don’t think the issue come by CentOS. It’s just crappy hardware, which is silent, powerful and low consumption enough to play with the toy. Installed 7.5 RC at two servers, installation was a little bit tricky, but the systems work without problems now. We have nextcloud installation on our production server and it’s working since beta without problems. Do you mind to open another thread and report the problem? Please let us know if you’re using a virtualhost or not and what are the errors inside /var/log/http/ directory along with errors from /var/opt/rh/rh-php71/log/php-fpm/error.log. Upgraded a virtualbox 7.4 test server with NextCloud from the software center successfully. Haven’t dared to try the update with any of my other production servers. Very short of free time, one of the reasons I haven’t been active here. Now the production servers are held up for updates because they are still all or nothing upgrades from the gui. It’s time consuming to figure out which security related updates can be applied without triggering a dependency based, full distro upgrade to 7.5. Just create a class with a reserved bandwidth, then go the firewall rules and create a rule matching voip traffic.